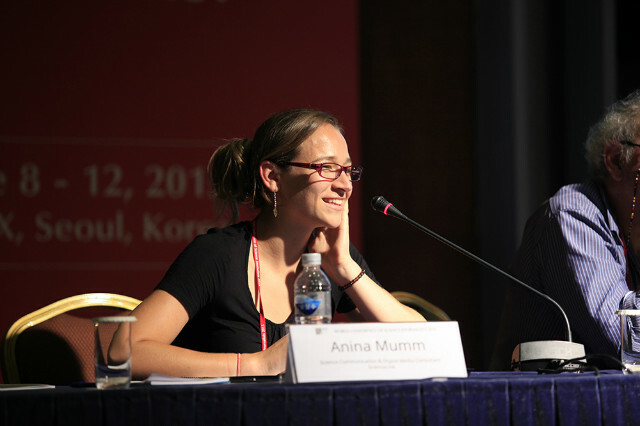 At the recent World Conference of Science Journalists in Seoul (yes, the same conference where Nobel scientist Sir Tim Hunt put his foot in his mouth with his sexist comments), I had the privilege of representing the Oxpeckers Centre for Investigative Environmental Journalism on a panel titled “From drones to floating smartphones: how technology is helping science journalists investigate”. Prior to my session, I attended a fabulous workshop on geojournalism by Gustavo Faleiros and Willie Shubert from Internews’ Earth Journalism Network, and Clara Rondonuwu of Ekuatorial.com. A point brought up during that session and various other discussions I had throughout the conference, is that although journalists get very excited by new technologies available to them, most report on how cool those new tools are rather than actually using them. I was hence very happy to report during my panel session, to a packed room of journalists, that Oxpeckers both creates and applies new technologies for investigative environmental reporting in Africa. It is a new kind of journalism, I said, that creates visual narratives while empowering civic society and other journalists, to take action and ensure accountability. I demonstrated the tools, like the Rhino Poachers Court Cases tool, the poaching map on the main Oxpeckers page, and the new #GreenAlert app. And I showed them the journalism, in the form of stories published on Oxpeckers and elsewhere in the media. I also shared the challenges of data journalism and access to information in South Africa, something journalists all over the world have to deal with. On a positive note, many in the room agreed that accessing data is only one route, because savvy journalists can create reliable data sets through various other means. A few people came up to me afterwards to say, “You guys are really doing it right”. In summary, the conference was a great source of inspiration for building the Oxpeckers’ brand of geojournalism and in-depth, science-based environmental reporting. And, at least for me, it provided some validation from an international journalism community that Oxpeckers is on the right path. Anina Mumm is a science communication and digital media consultant at ScienceLink, an Oxpeckers associate, and the chairperson of South African NPO SciBraai. She thanks the South African Science Journalists’ Association, in particular Lynne Smit and Mandi Smallhorne, as well as Raymond Joseph and Harry Dugmore, for a great panel session.